← Listen to 257- Reversing the Grid from 99% Invisible in Podcasts. If regular automakers aren’t advertising their electric cars well enough, maybe purveyors of electric-car infrastructure can fill in the gaps. Electrify America, VW’s court-mandated effort to build a nationwide DC fast-charge network, is launching its first ad campaign Monday on behalf of all electric cars. Called the “Jetstones,” the ad campaign contrasts the stone-age Flintstones cartoon characters with the futuristic family in the (now almost equally old) Jetsons cartoon. The Flintstones character, wearing a full beard and plaid shirt, pulls up to a stoplight in an aging Subaru Outback, painted orange to evoke Fred Flintstone’s stone-wheeled, foot powered car. On the back is a “Planet hugger” bumper sticker. Next to him pulls the same actor, beard shaven, looking freshly rested, in a Chevy Bolt EV. As the Flintstones theme song switches over to the Jetsons’, “George Jetson” dashes silently off, leaving Fred Flintstone, feet firmly planted inside the car on the pedals, stuck dopily at the stoplight. Since VW is required to make its Electrify America efforts brand-independent to spread electric cars, the company shows electric models from six automakers at the end of the clip: the Chevy Bolt EV, the BMW i3, the VW e-Golf, the Honda Clarity Electric, and the Nissan Leaf driving off into the sunset. In between, as the ad talks about electric-car affordability, it shows the Hyundai Ioniq Electric at an Electrify America DC fast-charge station. IHS Markit tallies 46 plug-in models on the market now, and says that number will rise to 70 models by 2020 and 258 by 2025, which may represent the majority of the car market. In conjunction with the new ads Electrify America is launching a website, www.plugintothepresent.com, that promotes electric cars as affordable, with longer ranges of about 250 miles, and that ultra-fast 350-kw DC fast chargers will replenish batteries nearly as quickly as fuel from a pump. 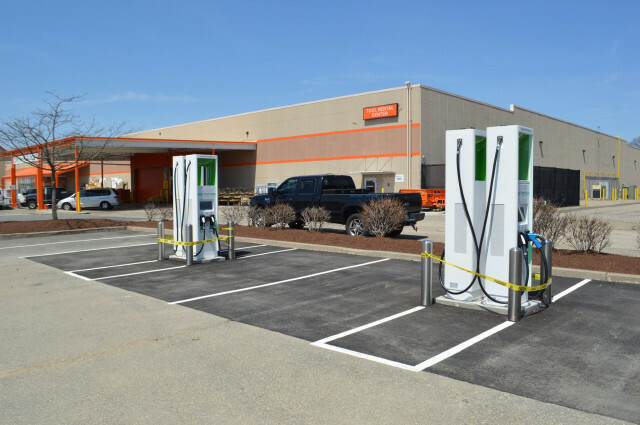 Electrify America is already installing such chargers. It even promotes the benefits of hydrogen fuel-cell cars. Electrify America is in the first phase of rolling out $2 billion in electric car charging stations—most of which will be DC fast chargers—throughout the U.S. The effort will also include ads like the “Jetstones.” A consent decree with the court over Volkswagen’s diesel emissions cheating requires that the company complete the charging network by 2025.